and download your copy of the eBook – at NO CHARGE! 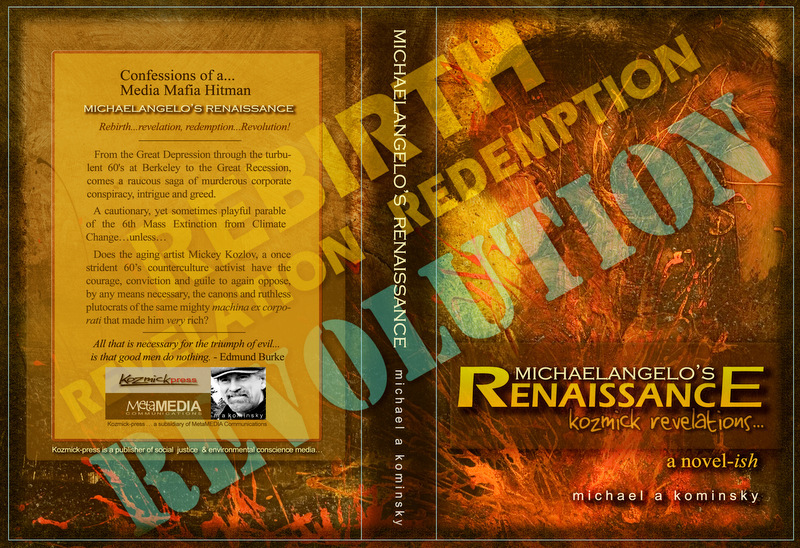 An epic allegory of REBIRTH–Revelation–Redemption…and REVOLUTION! From the Great Depression through the turbulent 60′s at Berkeley to the Great Recession, comes a raucous saga of corporate conspiracy, intrigue, greed and…murder. Michaelangelo Kozlov, a self-satisfied plutocrat and successful “media hitman”—for the Media Mafia, a contract assassin of character—is livin’ large, when his idyllic lifestyle is shattered by a putative attack by Islamic terrorists a month after 9/11 provoking a painfully honest re-examination of his callow core values. Does the aging artist Mickey Kozlov, a once strident 60’s counterculture activist have the courage, conviction and guile to again oppose, by any means necessary, the canons and ruthless plutocrats of the same mighty machina ex corporati that made him very rich? Based on true events—the 1999 petroleum pipeline explosion in Bellingham Washington. So this tragic incident became the inspirational and aspirational genesis; a roman à clef, (Fr. a novel with a key) or a novel about real life, overlaid with a facade of fiction. Certain liberties were taken with the facts, including causation and dates for literary and dramatic purposes. With the exception of notable historical figures, all the characters are fictitious–any resemblance to the bad guys, living or dead, is purely coincidental…unless it ain’t. The main protagonist Michaelangelo Kozlov bears more than a casual resemblance to the author…insofar as the similitude and abundance of disturbing foibles and irritating eccentricities. So in someways, this is my ‘Russian Novel’…a dark, Slavic melancholy morality play…panoramic in scope with lots and lots of characters over an ambitious time line….my contemporary take on Boris Pasternak’s brilliant pre/post-revolution epic Dr Zhivago…as may have been told by Mel Brooks. MetaMEDIA Communcations is a full-service Broadcast quality production and media design facility, specializing in book design/layout and companion products including author promotional video.